Platinum, white gold, and rose gold get a lot of love these days in the bridal world, but yellow gold has been a staple in bridal jewelry for a reason. We have a large variety of yellow gold wedding bands that are appropriate for women to wear next to an engagement ring, other diamond bands, or alone. You may see the available precious metal options by exploring the provided drop-down menu on the product page. I wanted to highlight a few of our most impressive yellow gold and diamond wedding rings. You may learn more about each of them by clicking on the provided link or the image that is included below. 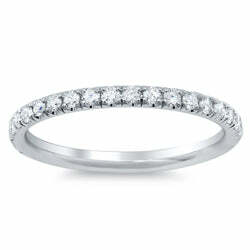 This design is one of our most traditional wedding bands. It features u pave set diamonds half-way around the ring that weigh approximately 0.40 cttw. The diamonds have F-G color with VS clarity. The ring can be easily paired with any number of engagement ring designs and will make a lovely stackable ring. 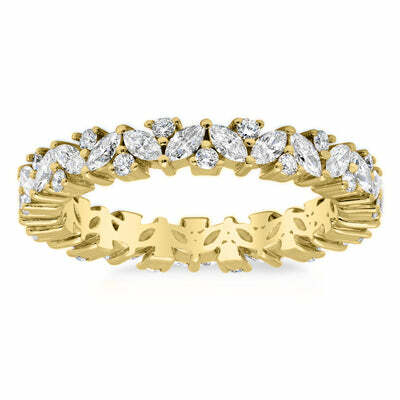 The marquise and round brilliant cut diamonds in this ring give this design the resemblance of a garland or laurel. The ring has a 4mm width and is truly a statement piece. The ring features approximately 1.00 cttw of G color VS clarity diamonds. Another statement piece, the yellow gold complements the excess of princess and round brilliant cut diamonds. The ring is quite wide and has a 7.5mm width. This luxurious ring is set with approximately 3.75 cttw of F-G color VS clarity diamonds. 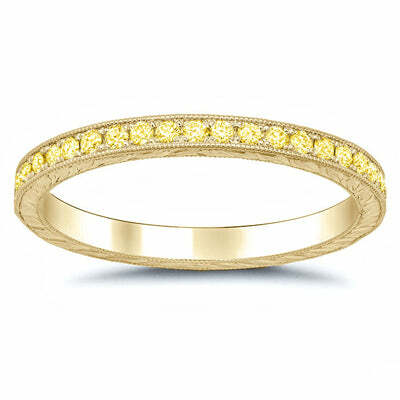 If you truly want to highlight a yellow gold wedding band, why not choose yellow diamonds? 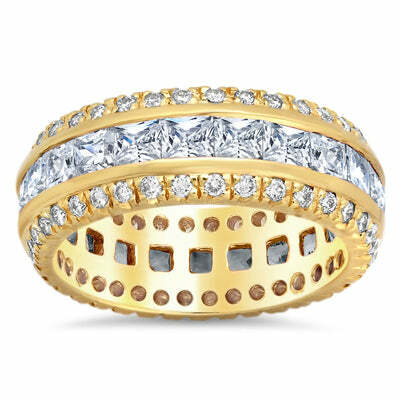 This ring features 0.50 cttw of fancy yellow round brilliant cut diamonds. We ring is completed with milgrain detail and hand engraving to give the ring an antique look.